Aquafeed Market size was over USD 95 billion in 2017 and industry expects consumption at over 95 million tons by 2024. Aquaculture Additives Market size was valued at over USD 985 million in 2017. Increasing consumption of seafood owing to rise in high quality demand for fish owing to its nutritional benefits may stimulate market demand. Favourable government regulations and standards by EU regarding the usage of insect protein in the product coupled with rise in disposable income may foster market size. Global fish production was estimated to be over 175 million tons in 2017 and is projected to grow at higher value in the foreseeable timeframe. According to FAO seafood accounted for over 15% of global population of animal protein intake. Increasing production along with expansion of fisheries in developing economies will drive the overall growth in fish production, thereby resulting in increased product demand. Technological development along with various modern techniques has created in upsurge in molluscs, shrimp and salmon feed demand, thus fostering marine production and industry growth. India accounted over 10% of the total aquafarming market share in 2017 owing to increased fish farming in the coastal areas coupled with government spending in fishery business. Increasing shrimp and other fish farming may create job opportunities and thus enhance aquafeed market size. Key ingredients for aquafeed production include fish meal and oil and about 35% of the total fishmeal is chiefly obtained from the fish by-products. Strict environmental regulations regarding the fish catching process in Peru and China may hinder industry growth. Moreover, favourable climatic conditions have a positive influence on the fish quality which in turn increases fishmeal import, thereby stimulating product market size. Amino acids based aquaculture additives market demand was valued at over USD 280 million in 2017. Proteins are essential ingredients for healthy and high growth rate of fish. Fish and prawns are incapable of synthesizing proteins into amino acids including threonine, tryptophan, methionine, lysine, valine and arginine. Fish also requires diet containing crude protein concentrate with an optimum growth of 30% to 35%, which may stimulate industry growth. Antibiotics based aquaculture additives market size should register gains at over 3.5% by the end of foreseeable timeframe. Antibiotics indorses growth which provides better health in crowded conditions and create an antibody for the species. Development of drug-resistance in bacteria in shrimp, fish and prawns have led to formulation of regulations by countries to limit use of antibiotics in feed and additives, may fuel the product demand. Vitamins based aquaculture additives market demand may surpass USD 80 million by 2024. It improves defense system, supports disease resistance and is an important feed additive for fish and shrimp. Vitamin C performs numerous biochemical and physiological functions in both animals and plants. Ascorbic acid used as a source for Vitamin C acts as a strong reducing agent and helps in optimum growth and disease resistance. Aquafeed market demand from crustaceans may register significant growth at over 11% up to 2024. Crustaceans are aquatic and survive both in marine and freshwater environments, while some have adapted to life on lands such as crabs. They provide a major share of omega fatty acids, vitamins, minerals and excellent source for amino acids including methionine, leucine, histidine, threonine and valine, thereby driving the industry growth. 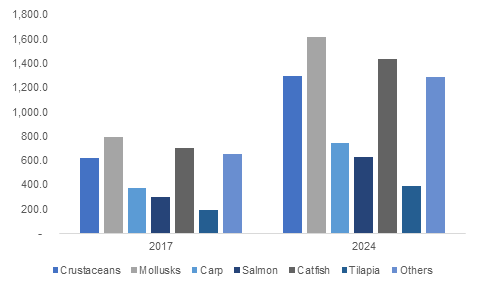 Aquafeed market size from mollusks is projected to reach about USD 35 billion by 2024. Farming of mollusks is sustainable and human involvement is required to feed them. FAO recommends not to farm mollusks in polluted water, as filter feeder mollusks like mussels may ingest biotoxins & bacteria and focus in their digestive systems. They are also used in therapeutic treatment of brain, thereby stimulating the product demand. Aquafeed market demand from salmon may register significant gains up to 11% by 2024. Salmon accounted over 50% of European finfish production, feed industry closely follow market development of Atlantic salmon which is predominantly concentrated in Scotland, Norway and Ireland. Salmon being the most popular seafood in Europe and is available in three forms including canned, frozen and fresh which may escalate the product growth. North America driven by Canada and the U.S. aquafeed market demand may surpass USD 20 billion by 2024. Increasing consumption of fish and demand for seafood coupled with rising middle-class disposable income may propel industry growth in the region. Government initiatives with institutional support for product development will drive regional industry growth. Major companies are investing for new product development for local and international market to expand their product portfolio. Europe driven by UK, France and Germany aquaculture additives market demand may register significant gains at over 4% by 2024. Europe is a rich and huge base for these product manufacturing resources such as fish meal, fish oil plant-based proteins and water bodies. Change in consumer preference and increasing processed fast food industry coupled with rising disposable income should propel regional industry growth. Asia Pacific aquafeed market size led by China, India and Japan may surpass USD 150 billion by the end of foreseeable timeframe. Increasing resource availability, low labour wages and ambient environmental conditions should drive the regional industry growth. Increasing disposable income coupled with enhanced standard of living should stimulate the industry growth. 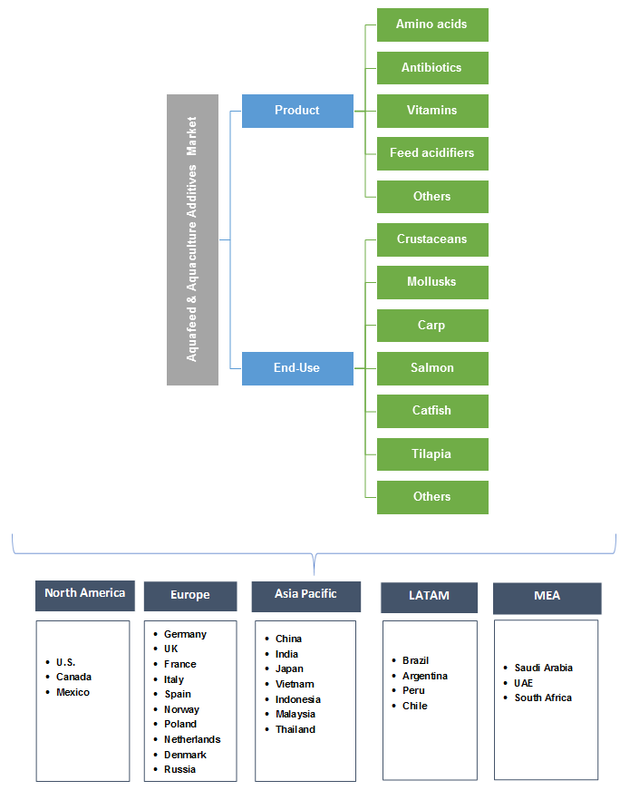 Global aquafeed & aquaculture additive market share is fragmented with companies such as Biomar, Ridely, Aller Aqua, BASF and DSM. The companies are involved in mergers & acquisition to enhance their production capacity and strengthen their global presence. Furthermore, the key participants are concentrating on new product launch to foster the overall market growth. Aquafeed contains energy and nutrient sources which are vital for fish growth and health. Deficiencies of these substances reduces growth rates and may lead to various diseases. Aquaculture additives are food supplements for aquatic animals for improvement of feed quality, thus enhancing the animal growth performance and health. Increasing fish consumption along with consumer consciousness towards health benefits driving industry growth. Manufacturers are investing in R&D and looking for suitable replacement to the raw materials which are used for functional feeds.